So, there we were relaxing on a Wednesday night. All the doors and windows were open while the TV blared the Tour de France. At the side door to the carport sat our Brand Ambassador, Agostino aka ‘Gus’ the Cat, defending us from the onslaught of bugs. Glancing over to him, we noticed a HUGE shadow moving towards the light. Was it a raccoon? A feral cat? His hackles rose like a T-Rex and his tail puffed like a raccoon confirming something was there. Jaime leaned forward to get a closer view and focused on the darkness. The dark mass quickly became a big brown nose and a large paw reaching out onto the screen. Her eyes swelled as she yelled “BEAR!” just as the screen door snapped from the pressure. Gus hissed and booked into the other room. Leaping over the ottoman, I yelled “GET OUT OF HERE!”, slamming the door in his face. Taking a big breath to calm things down, we surveyed our property. Not a single thing was out of place or even touched. Except for the broken door, you’d never know a bear stopped by to visit. Our personal story is a great opportunity to become more bear aware not just at home but on any outdoor adventure. Whether it’s your first time or you’re a regular outdoorsman heading out to hike, mountain bike or camp, safety is key. While many safety issues need to be a concern, bear safety is number one! 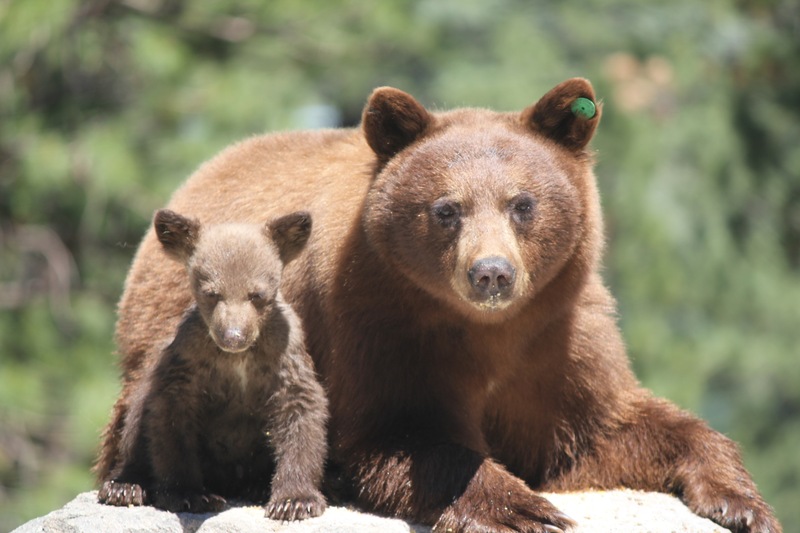 Nothing can guarantee your safety in bear country, but knowledge and proper behavior can greatly reduce your risk. A black bear sow and her cub, below Job’s Peak, NV. A lot of people think bears are unpredictable, but this is not true with bears any more than other creatures. They do things for a reason. A simple understanding of bear behavior can help avert dangerous confrontations. The good thing is both black and grizzly bears tend to be wary of humans and normally go out of their way to avoid us. Many wildlife specialists confirm this, but there are exceptions. The main exception is a food-conditioned bear. This is a bear that has had a previous encounter with a human and was rewarded with food or trash. The saying regarding this condition is, “A fed bear is a dead bear,” because often times these bears become a nuisance and danger to people. It’s sad, because it’s a human caused situation that can totally be avoided. As always knowledge is power, especially in the event of a confrontation. 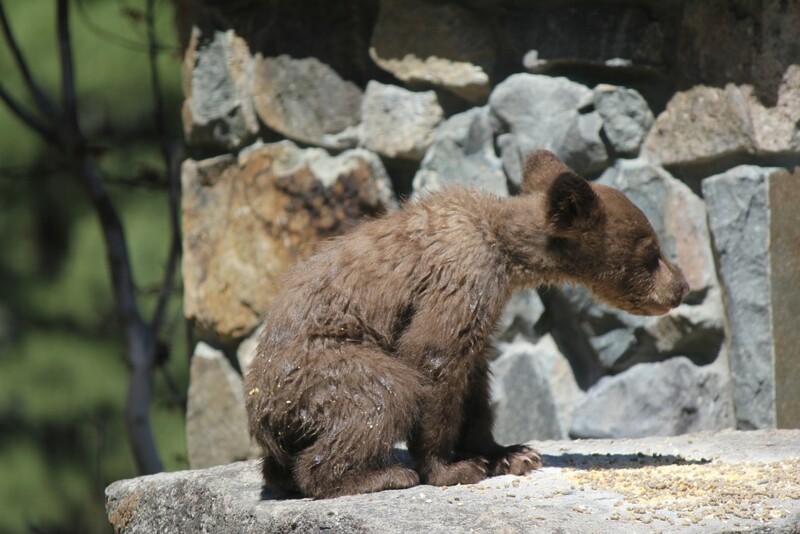 Below are some helpful tips for recreating in bear country. We are not experts and there are many resources online regarding this topic. Do your homework! Don’t feed or approach bears. Stay in your group and keep kids close. Be alert and make your presence known by singing, clapping and talking loudly. 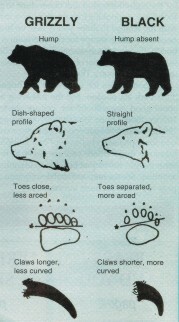 Use bear proof containers and leave no trace. Look for bear tracks, droppings and clawed ground or trees. Pay attention to your senses. Notice circling birds or strong odors that indicate an animal carcass. If you notice a bear in the distance, do not disturb it. Turn around or circle far around it. When you run into a bear that’s close or sees you, don’t panic! Stand your ground or back away slowly. If it follows, stop. Bears are curious and might approach for a better look. Wave your arms, stand tall, speak loudly and be human. When a bear charges, it’s normally a bluff. Your adrenaline will be rushing and your first reaction will be to flee. Never run, you won’t win this race. Running also triggers their instinctive reaction to chase. Don’t climb a tree unless it is right by you and you can get up high quick. Be big, loud and intimidating. If a bear attacks, you first need to know what kind of bear it is before you react. See the chart provided to help identify the type. If a black bear attacks, fight back. Use whatever you can to strike the bear in the nose or eyes. When dealing with a grizzly, play dead. Curl up in the fetal position to protect vital organs. It isn’t necessary to carry a weapon when in the wilderness. Using common sense is the best defense. Most of the time preparation and traveling carefully are all that is needed. If additional protection makes you more comfortable, consider carrying pepper spray. Bears’ noses are 100 times more sensitive than humans. Think how irritated your nose becomes when you accidentally sniff pepper. This incapacitating spray teaches bears a lesson without permanently injuring them. Be sure to read the directions. Lastly, in areas where you are allowed to carry a gun, I still don’t recommend this method of protection. More people are injured each year by the guns they carry than by bears. Also, by using the methods above, you should be able to avoid any encounter which will make the gun unnecessary on your trip and just add extra weight to your pack. If this is your choice and last resort, try firing a warning shot. Normally, this is enough to stop a charge and deter the animal. With 20 years of outdoor experience and numerous bear encounters, I have never had to use protections. Simply staying calm and standing my ground has proved successful. When out in the wild remember these tips and they should prove effective. Enjoy! A curious cub found bird feed.